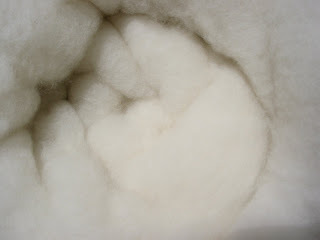 Some saddle fitters say that mixing types of wool/flocking can affect the panel resistance on the saddle and allow for unlevelness due to different flocking having different bounce. I guess those are your purists. Not all fitters are so particular, though. Unscrupulous fitters might even use things like yarn or old rags to stuff a saddle. I think saddle fitters have "stories to tell" -- the way fisherman talk about what they find in the belly of a shark, I bet saddle fitters talk about what they find used for flocking! According to some saddle fitters, complete reflocks can not be done in a day. Why not? Because the flocking needs to settle for at least 24 hours as, even the most experienced saddlers have have found, sometime wool will settle and create holes. I have heard horror stories of stuff found inside saddles. I use a fantastic master saddler who uses pure wool. I did have someone do a quick fix once with adding synthetic and it was bad. It did lump. It would be interesting to hear some of the stories as well as the opinions of saddle fitters. I wonder what Kitt at Trumbull mountain thinks. Should check with my saddle fitter friend. She always says "wool," so I'm guessing she's a purist. Hmm, that is really interesting. I wonder what saddle fitters in general think about the new "air-filled" panels, or God forbid, foam? I'll be honest and say I have absolutely no idea what's inside my saddle's panels. As a lesson student, I'm just glad it fits a good variety of backs (it's a nice saddle but didn't cost the earth, so I wouldn't be suprised if it IS foam). I have a very old - exactly how old I don't know as I bought it used in 1988 - Crosby Prix de Nations, which has panels crushed down into practically nothing. I'm sure they are wool. If I ever wanted to use it again it would definitely need to be reflocked. For now it just serves as a decorative piece on a shelf!